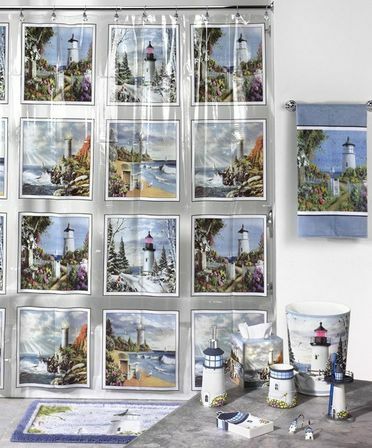 Everyone who wanted to make the bathroom looking really originally and interesting should definitely pay their attention on the lighthouse bathroom decor as it’s gonna look so interesting if you follow all our advises. 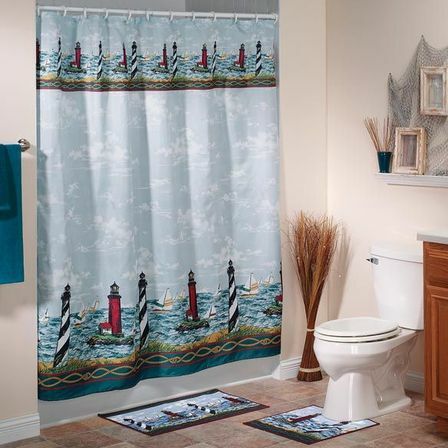 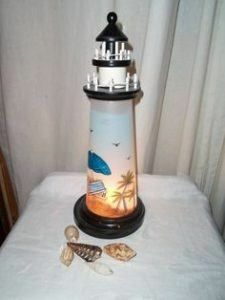 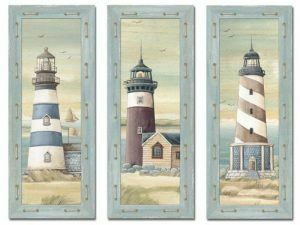 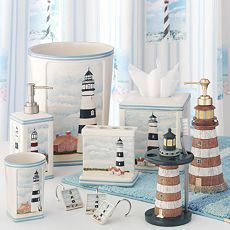 The main color solutions as for most of the sea themes is still white and blue, but at the same time lets don’t forget that the lighthouse is most of the time the building made from the stone and wood so you should also definitely include those elements to your bathroom decoration and complete it with the other typical lighthouse accessories. 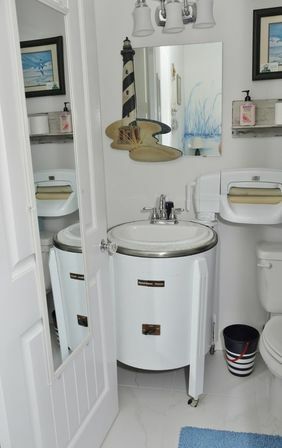 There are actually so many elements you should pay your attention on and one of them is definitely the bathroom furniture, but let’s talk about it one by one. 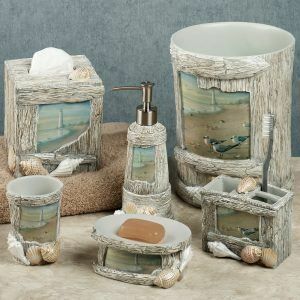 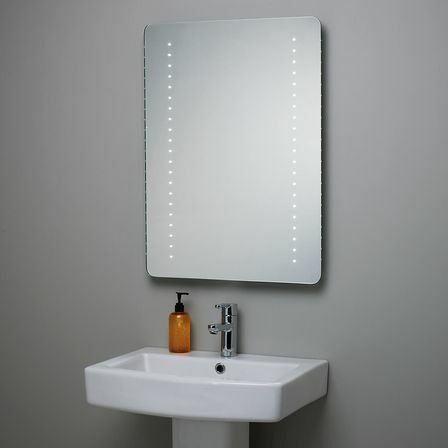 The lighthouse bathroom elements features. Made with the ceramic tiles. 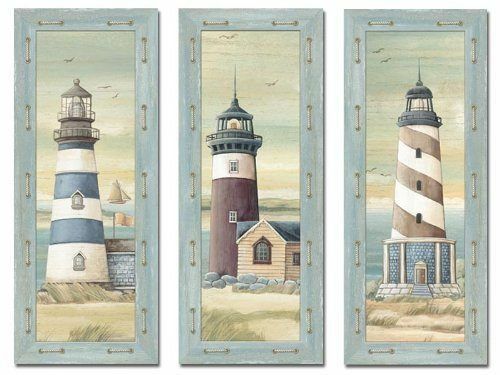 Painted into the light colors. Covered with the special moisture-proof wallpapers. Or decorated with the tile or mosaic elements. This solution is actually the most popular one and will for this kind of bathroom the most as it can totally help us to make the real stones wall look. 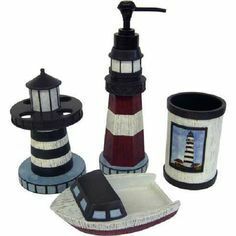 It’s better if the furniture is gonna be made looking like the old one – like it’s been hided in the old lighthouse for years and still remember the old lighthouse keeper’s touch on its surface. But moreover it can be made from a twisted wood or be represented by the bathroom cabinets painted into the light or dark blue colors – you can definitely play with it’s shades. 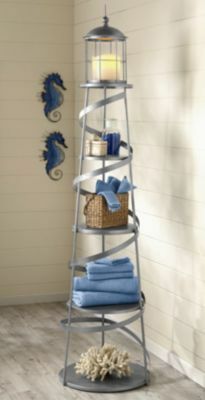 It’s definitely gonna look organic if you will complete the interior with the wooden or a twisted wood basket. 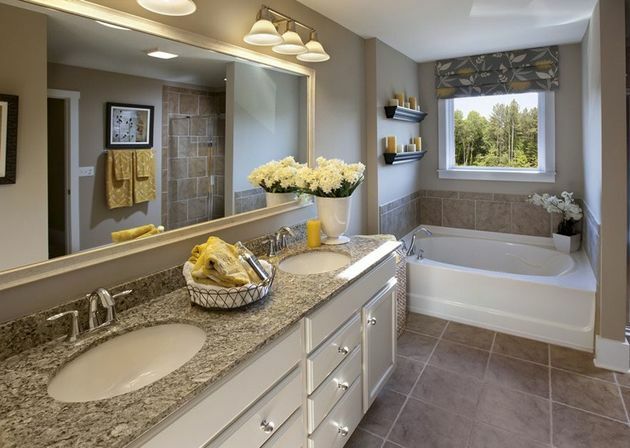 As usual for this kind of interior the floor can be made from the wooden panels or with the ceramic tile which is definitely more convenient for the place with the high moisture level. 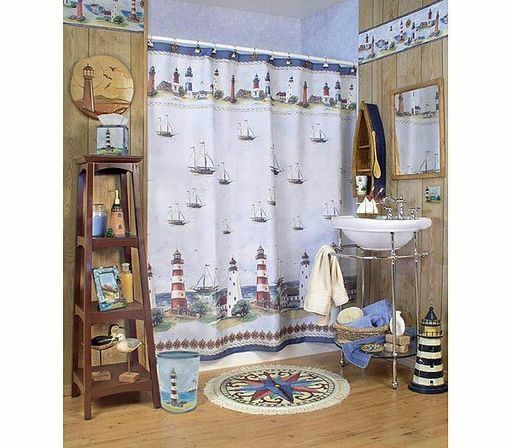 If you like to follow the modern decoration waves than you should definitely pay your attention on the new designer trick such as using the antic looking bathroom furniture in the lighthouse bathrooms or when the designers even combine the old looking style with the modern technique. Here you can definitely establish the bathroom sanitary made from the copper and covered with chrome same as the bathroom sink’s mixers. The lighting can be definitely represented with the special thematical lighting fixtures that will surely fit this kind of style and it’s gonna look even more interesting if you gonna choose and buy the pending lighting with the dull diffusing lamps inside. Talking generally the design should perfectly fit and represent the atmosphere of lightness, calmness and romantic mood. 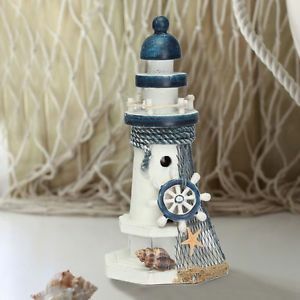 And the main color gamma idea is to remind us about the same sea side colors as the turquoise, all the shades of blue and the waves shades. 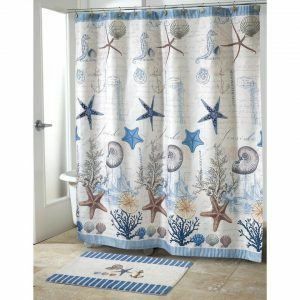 Sent color and the light creamy shades will also definitely make the right sea side accents. 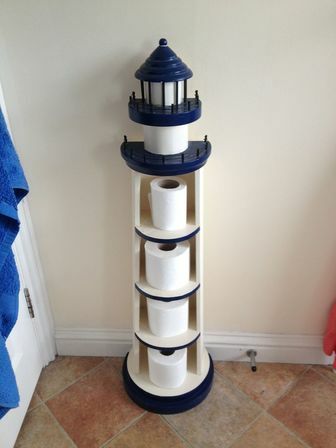 The bathroom sanitary engineering will surely fit all the blue shades, but let’s also don’t forget that the main idea isn’t only about the sea, but more about the lighthouse decor so it’s better if you establish not just the sink, but a specially threatened wooden bathroom vanity or even the wooden rounded bath that can be completed with the towels and the towel’s hangers having the lighthouse bathroom decor motives. 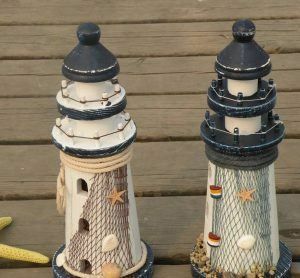 But if you are not satisfied with the simple wooden solutions and prefer to have the lighthouse lighted with the sun inside, than you can definitely color all your wooden pieces into the more light brown and yellow shades. 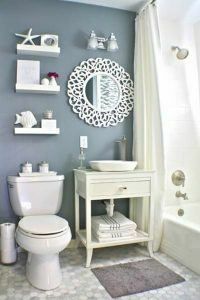 The best variant of the ceiling decoration is still a tile using as we are talking about the zone with the high moisture level and need to be sure we won’t need to redo the whole bathroom repairing all over again after just the few years as the wooden panels start to get a rot (but even here you can find the materials that ad super moisture-proof and can be used even on the ships). 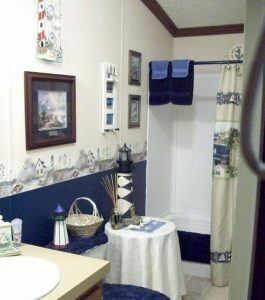 Moreover the tile is super convenient if we talk about the color choosing as nowadays we have like a real mass of varieties and pay our attention on any of them choosing or the waves playing under our feet, or the beach full of sent or even the same wooden floor, but the one that will never get a rot. 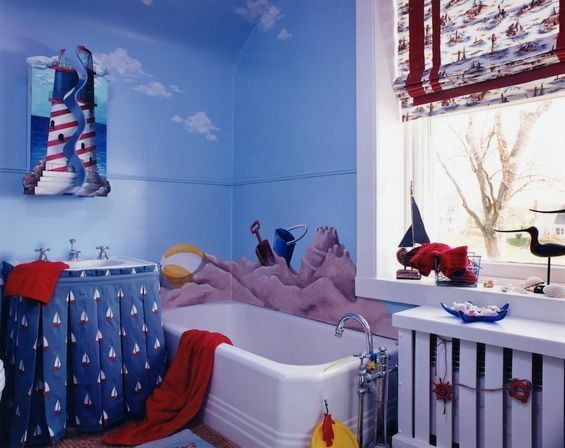 There are also so many ceiling varieties as it can be a pending ceiling, the one made form a gypsum plasterboard, but the cheapest variant is just to cover it with the special sticking covering that can make any kind of a decoration story and have any print on it. 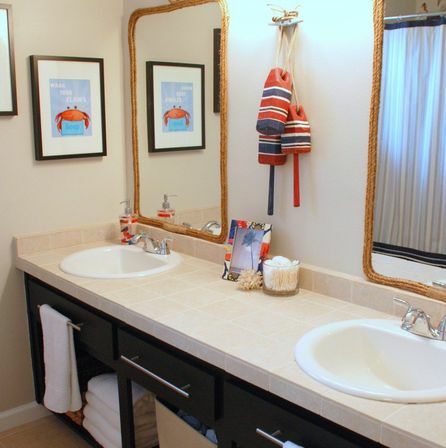 It can be also filled with the tile, but this variant isn’t really that esthetic. 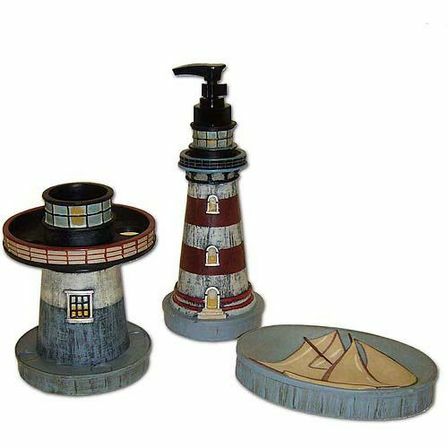 The other thing you can do is to place the floor on the ceiling which means that you can make the ceiling with the wooden panels painted in the color you want and most of the times it’s the white color as it really fits the lighthouse bathroom decor thematic. So this is the last “ocean story” and all you need to do now is to go on the seaside, get your own inspiration and combine it with our advises.